Submerged sites of ancient communities could be hidden in the seas around the Western Isles, according to experts. Dr Jonathan Benjamin and Dr Andrew Bicket believe the islands' long and sheltered lochs have protected 9,000-year-old Mesolithic relics. Rising sea levels may have covered up to 6.2 miles (10km) of land on the west coast of the Outer Hebrides. The archaeologists are to give a presentation in Comhairle nan Eilean Siar's council chambers on Monday. During the Mesolithic period, also known as the Middle Stone Age, Britain was transformed from a peninsula to an island. It is thought that landslides in Norway - the Storegga Slides - triggered one of the biggest tsunamis ever recorded on Earth when a landlocked sea burst its banks. The water struck the north-east of Britain with such force it travelled 25 miles (40km) inland, turning low-lying plains into what is now the North Sea, and marshlands to the south into the Channel. Dr Benjamin has conducted fieldwork in the UK, the Mediterranean, Scandinavia and North America. He recently returned from test excavations at an underwater late Mesolithic site in Denmark that is more than 6,500 years old. Dr Bicket is an expert in coastal geoarchaeology and is currently working in both the UK and Mediterranean as part of an international team focusing on the coastal prehistory of Greece and Italy. Both work for Wessex Archaeology, which has offices across England and one in Edinburgh. The Western Isles' coasts have been a rich source of archaeology in the past. 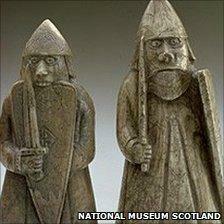 The 12th Century Lewis Chessmen were found beneath a sand dune near Uig on the west coast of Lewis at some point before 1831. More recently, in 2007, ancient coins were discovered on a beach giving new clues to the far reaching influence of the Roman Empire. Archaeologists believed the pieces of copper alloy dated from the middle of the 4th Century. Like the chess pieces they were found in a sand dune, but the location in the Uists has been kept secret to protect the site.